Olivia by O. Douglas ~ 1912. Original title: Olivia in India: The Adventures of a Chota Miss Sahib. This edition: Nelson, 1950. Hardcover. 281 pages. Provenance: Shepherd Books, Victoria B.C., September 2013. The first published work by Anna Buchan, written under her pen name O. Douglas. 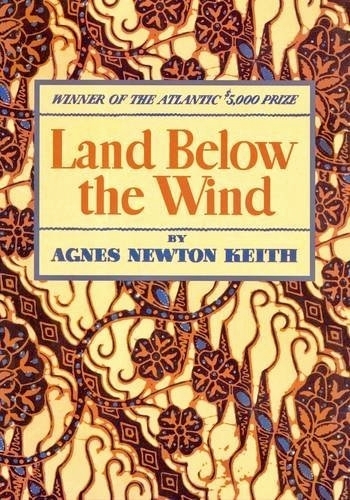 This slight epistolary novel is based on Anna’s own 1907 voyage to India to visit her younger brother William; the characters “Olivia” and “Boggley” are obviously very lightly veiled depictions of Anna and William, and there is even a reference or two to another brother, “John”, who is a highly regarded novelist. 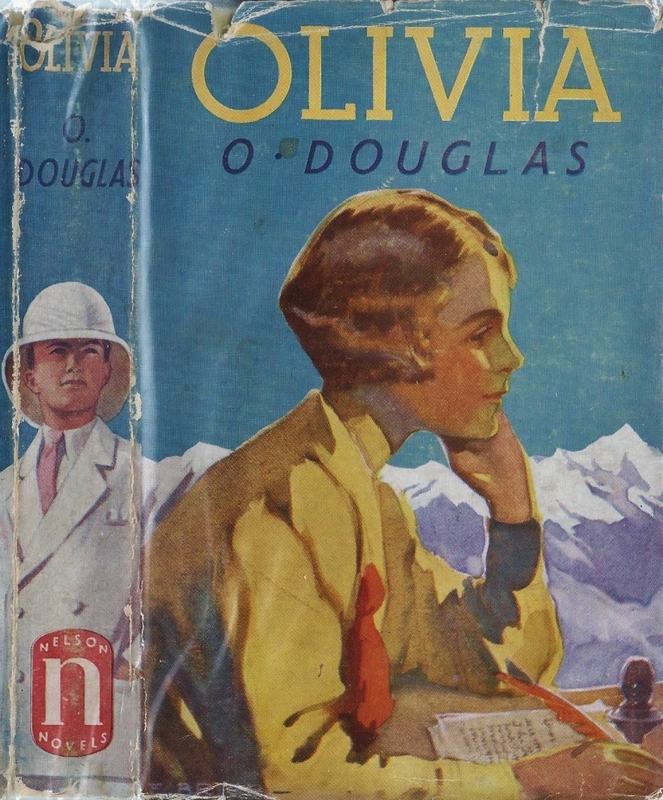 John Buchan – of The Thirty-Nine Steps fame – was of course a very real person, and though “Olivia” throughout refers to her family name as “Douglas”, we can’t help but draw the simple conclusion that this is mostly autobiography, presented as fiction. India in the years of the Raj has been so often and thoroughly documented both in fact and fiction that it exists in our readerly imaginations as a defined time and place with expected characters, settings and situations. Olivia does nothing to further illuminate any of this, merely laying down another layer of sepia-tinted varnish on an already-finished picture. I found the book enjoyable enough in a mild way; in common with all of the author’s other novels the people are very believable, being a mixture of good and not so good, and the situations are realistically described. It differs from most of O Douglas’s later novels which have a traditional plot structure in that in this one nothing really happens, aside from the expected incidents of domestic adventure and foreign travel. Olivia journeys about, sightseeing and marking time, all the while writing to an unnamed correspondent back home, whom we are able to identify early on as a person of potentially romantic interest. The nearest thing to a climax occurs at the very end of the book, when the correspondent is given a name, and Olivia commits herself so far as to accept his apparent proposal of an enlargement and formalization of their “friendship” when she returns to England. Though it sounds as if I were damning this quiet book with faint praise, it wasn’t actually all that bad. The scenes throughout are engagingly described and occasional vignettes stand out, as when Olivia sees the Himalayas for the first time, after a less-than-comfortable train journey. And there are enough references to the political situation and dreadful things going on all about – the poverty of much of the native population and certain of the lower class Europeans and Eurasians, the constant occurrence of sudden death from misadventure and virulent tropical diseases, the occasional “throwing of bombs” by radical demonstrators – to keep the tone from being at all saccharine. 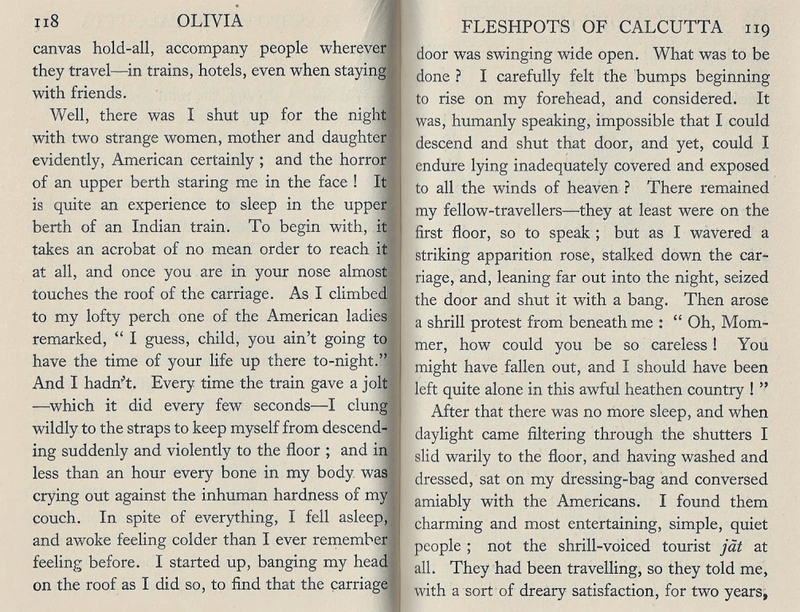 Olivia herself has a rather snobbish attitude to anyone not of her class, race and religion – these being upper, Scottish, and Presbyterian – but she does recognize this tendency in herself and occasionally puts herself out to overcome her prejudices, though to the end of her travels she remains fastidiously suspicious of the natives of the country. Very much a first book, but, to be fair, quite a good one. It held my interest throughout, though I am sure most of it will fade away quite quickly to join the rest of the era’s Anglo-Indian accounts of chirpy young Great Britain-ites off to visit the exotic Colonial Outposts, before it all fell apart. 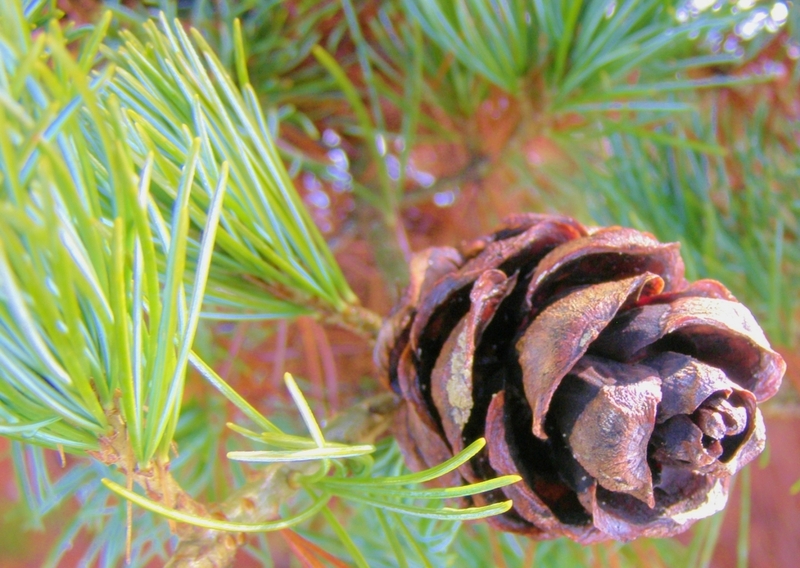 Pine cone, exact species unknown. UBC Botanical Garden, February 26, 2014. 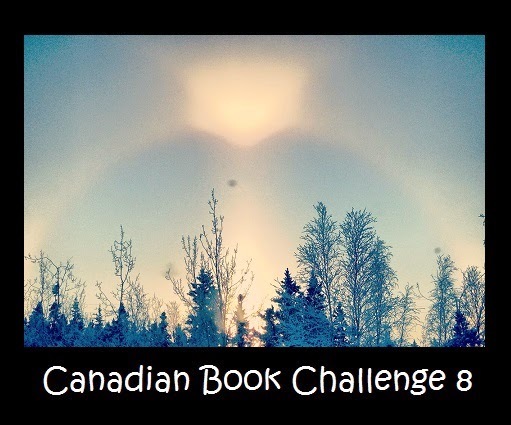 The next three books in my series of Round-Up posts all involve some sort of autobiographical experiences, though they are presented in different ways. Gavin Maxwell’s Harpoon Venture is self-critical and hyper-realistic; Rosemary Taylor’s Harem Scare’m goes for the gently self-mocking humorous approach, while W.H. Davies’ The Autobiography of a Super-Tramp is in the nature of a unemotionally-documented saga, told in the plainest of language by a man looking backwards down the years at his unconventional and occasionally dramatic vagabond (quite literally) days. Harpoon Venture by Gavin Maxwell ~1952. This edition: Lyons Press, 1996. Introduction by Stephen J. Bodio. Softcover. ISBN: 1-58574-370-4. 304 pages. If you have read Gavin Maxwell’s memoirs of his life with pet otters and other various creatures, Ring of Bright Water, Raven Seek Thy Brother, and The House of Elrig, you will recall his passing references to his several immediately post-WW II years spent hunting basking sharks off the Isle of Soay, in Scotland’s Inner Hebrides, close to the Isle of Skye. Two years later Gavin Maxwell was serving with Special Forces and stationed in northwest Scotland, when he joined a friend for a yacht trip during their leave and first came across the small, steep-hilled Isle of Soay. After spending two hours roaming the island, Maxwell had determined to make his dream a reality; he would buy it, establish a local industry, and spend his days in peaceful usefulness, looked up to as a local benefactor, the “laird”, in fact. Needless to say, such utopian dreams were to prove to be too good to be true. The industry Maxwell decided upon was the establishment of a basking shark fishery, to chase down, harpoon and render into useful products the massive, plankton-eating basking sharks, which can reach weights of over 5 tons. These sharks contain huge livers which were at the time in great demand for their oil content, but Maxwell’s scheme involved a factory which would process all of the parts of the fish – skin which could be turned to leather, flesh which could be marketed as “sail-fish”, fins to be dried and sent to China as aphrodisiacs, cartilage and bones to be used to produce glue – the list of possibilities was endless. 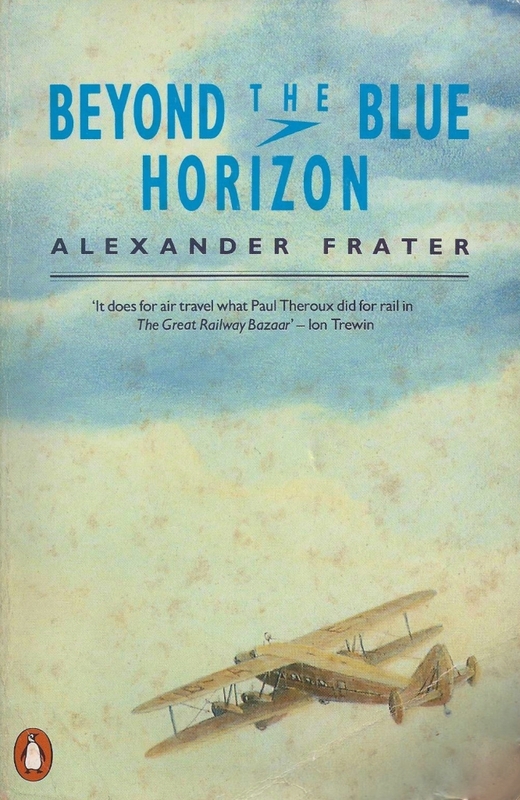 It took almost four years for Maxwell’s enterprise to bankrupt itself; he never really recovered from the loss of his personal fortune which he had sunk into the project; he lost Soay and embarked upon a vagabond lifestyle of travelling and writing, which resulted in the acquisition while in the marshes of Iraq of the first of the famous otters. But this was before that, and fascinating it is all on its own merits, though the brutal details of the process of hunting, harpooning and killing the basking sharks may be queasy-making to those readers of delicate sensibilities. Somehow the narrative manages to transcend the sordid details, leaving one with a portrait of a brilliantly intelligent, highly observant and sensitive yet deeply self-destructive man, who frequently made some very bad decisions, and only sometimes took responsibility for them. My final impression is of a book of intense experiences delicately observed and lyrically depicted. One hint: Avoid the Lyons Press edition, pictured above. For some odd reason it leaves out all of the photographs – over seventy in number – which are referenced throughout the text, giving a rather surreal experience to the reader as Maxwell has continually linked his written narrative to the photos, and without them one is left completely at a loss as to what is being referred to. 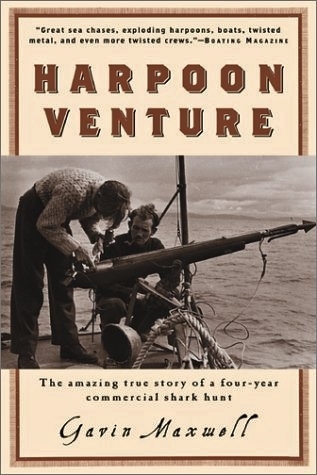 Second-hand copies of earlier editions of this book are readily available, generally titled Harpoon at a Venture, so go for one of those instead of the 1996 Lyons reprint. 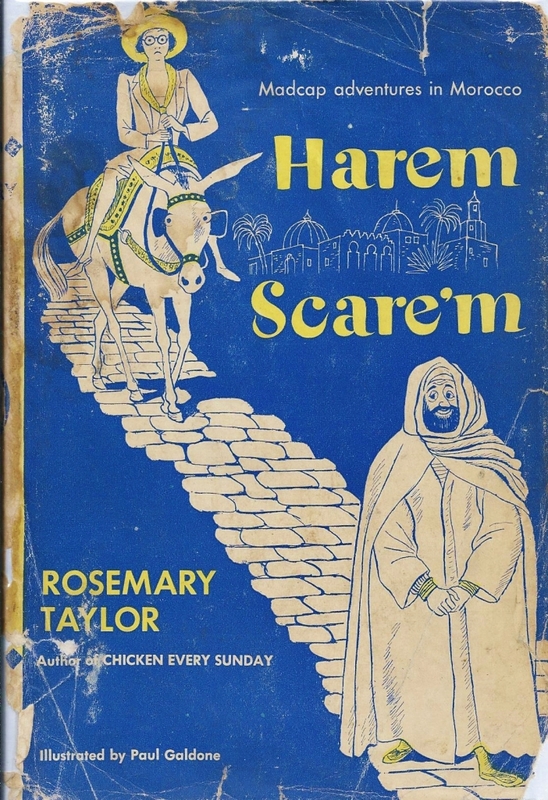 Harem Scare’m by Rosemary Taylor ~ 1951. This edition: Thomas Y. Crowell, 1951. Illustrations by Paul Galdone. Hardcover. 246 pages. This was another one of those happy-chance stumble-upon books. I had read and written about Rosemary Taylor’s Arizona childhood memoir Chicken Every Sunday back in 2012, and then, just recently in March 2014 had received a comment on my post, which brought Taylor to mind again. Only a day or two later what should I notice among the tattered hodge-podge of old cookbooks and automotive repair manuals at a local antiques emporium, but “Rosemary Taylor” on the spine of a book. And here it is. Isn’t random promising-book-discovery a wonderful thing?! Written in the early 1950s, Harem Scare’m is Rosemary’s account of her time as a young, aspiring writer in the early 1920s, when she was travelling with a friend in Europe on a break from her first job as an assistant dean of women at Stanford University. So there I sat, the future dean of women, dressed in the brown coat and tight-fitting white felt hat I’d bought at such a bargain in a little shop in Paris, wearing no make-up – I didn’t approve of make-up – my legs encased in lisle stockings, my shoes stout and sensible, and on my nose big horn-rimmed glasses, for I was, and am, very near-sighted. A prim and proper young lady, attending strictly to her own business, definitely not provocative, definitely not the type to invite any attention, welcome or unwelcome. Or so I thought. An optimistic Spanish porter appears to think that Miss Taylor is very provocative, and as she fights him off with determination she is vastly relieved by the entry into her compartment of a one-eyed man, who turns out to be a fellow American, one Floyd Gibbons. The name sounds vaguely familiar to Rosemary, and she is grateful for Mr. Gibbons’ large and protective presence for the remainder of her trip. Floyd, who is of course the Floyd Gibbons, intrepid and well-known war correspondent for the Chicago Tribune, is on his way to Morocco, to cover the events of the Second Moroccan War, the long drawn out series of clashes between the Spanish and French forces with the Moroccans, also known as the Rif War. Well, as things turned out, Rosemary did go to Morocco with Floyd, joining a bevy of other war correspondents, and she did get an interview in a harem, which she wrote up for the Citizen. She also found herself in many unexpected places, which she writes about with self-effacing good humour and occasional passionate poignancy. Rosemary tries very hard to keep the tone light throughout, and though this makes for a not-very-deep but entertaining read, one sometimes feels like she is leaving a lot of interesting stuff out, by deciding to go for the laugh every time, which is why I couldn’t in good conscience rate it much higher. Rather fascinating stuff, though, with much scope for further investigation. I’ll certainly be paying attention the next time I come across Floyd Gibbons’ name; he sounds like a very interesting personality indeed, and Rosemary Taylor’s depiction of him in Harem Scare’m is affectionate and appealing. Not my personal copy, but a much later edition with an apt cover photo. The Autobiography of a Super-Tramp by W.H. Davies ~ 1908. This edition: Jonathan Cape, 1933. Introduction by George Bernard Shaw. Hardcover. 304 pages. There’s a lot in this book, reminiscences of a long and event-filled life, by a sometimes less-than-sympathetic narrator, whose deadpan delivery takes some getting used to, but is worth putting up with for the vivid picture the book gives of a very unconventional attitude and way of living. I suspect this is the most well-known of the three books in this grouping, being still in print over a century after its first publication, so I won’t go into too much detail. Born in Wales in 1871, William Henry Davies was raised by his maternal grandparents, and from childhood showed a reluctance to follow in the expected path of others of his class and circumstance. Unable to settle into steady work, Davies abandoned his apprenticeship with a picture-frame maker and instead took to the roads, living on income derived from temporary work, a small income from a legacy, and eventually outright begging. 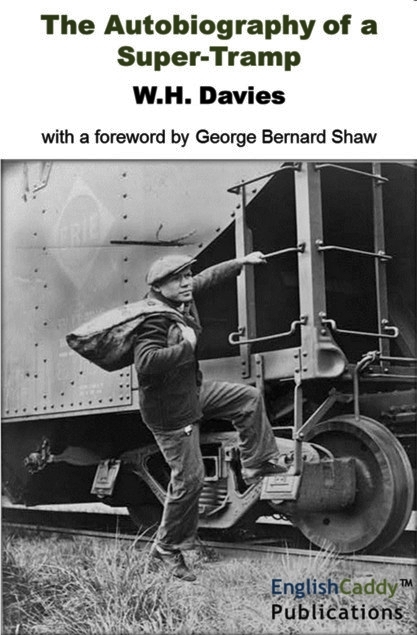 Davies was fascinated with North America, and eventually made it to the United States, where he joined a loosely connected tribe of “professional” hoboes who travelled the country by stealing rides in and on top of boxcars. They fed themselves on the charity of housewives and by taking on odd jobs, picking fruit, working as seasonal laborers and such. Davies was able to extensively travel throughout the States, and he crossed the Atlantic to and from England numerous times by working of his passage on cattle boats. 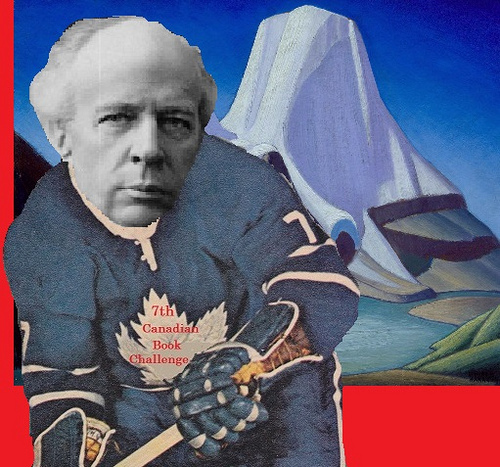 His foray into Canada on the way to the Klondike gold rush ended horribly when he slipped while attempting to jump a train in Ontario, losing his foot and crushing his right leg, which was eventually amputated at the knee. Returning to England sporting a wooden peg leg, Davies turned his attention to writing poetry, as he had always been a great reader and secret writer through his vagabond years. Living in charity rooms and living off of his grandmother’s legacy, Davies wrote and wrote and wrote, eventually paying to have his verses printed and attempting to sell them door to door. He met with small success, but kept on, until a series of lucky coincidences brought his poetry into the public eye, where it was received with enthusiasm for its universal themes and sincere tone. George Bernard Shaw was shown the manuscript of this book, and by his patronage secured Davies a very favourable publishing deal, and the rest is history. Davies ended his days in England hobnobbing with the literary aristocracy of the time, a far cry from the days of stealing garments off of backyard clotheslines and dodging railroad cops. This memoir is stunning in the scope of its content, and in its unapologetic tone. Davies makes few excuses for his choice of lifestyle and where it took him; he was a keen observer of his companions of the road and the book is full of fascinating portraits of unconventional people and the even stranger events they were involved in. The Autobiography of a Super-Tramp is written in a very calm, almost overly flat style, and can occasionally be rather hard going as climax after climax is related matter-of-factly in Davies’ sober voice, but his musings on why he is like he is and how he relates to the others he meets in his journeyings and his pithy commentary on social peculiarities make it compelling reading. The Moon-Spinners by Mary Stewart ~ 1962. This edition: Hodder, 1964. Paperback. 264 pages. I don’t know what it is – perhaps the snowy weather and the early dark evenings – but this book completely hit the spot with me a few nights ago, following through to the next day as I surreptitiously raced to finish it off in between my proper occupations. Maybe the appeal comes from the sunny setting – the Isle of Crete at Easter, mountains alive with wildflowers – or possibly just the perfectly adorable love interest of our intelligent heroine – he’s slightly mysterious, rather handsome, charming even on his bed of pain, plus he throws himself wholeheartedly into the fray-of-the-moment, particularly if it’s to avenge damage done to his lady-love. 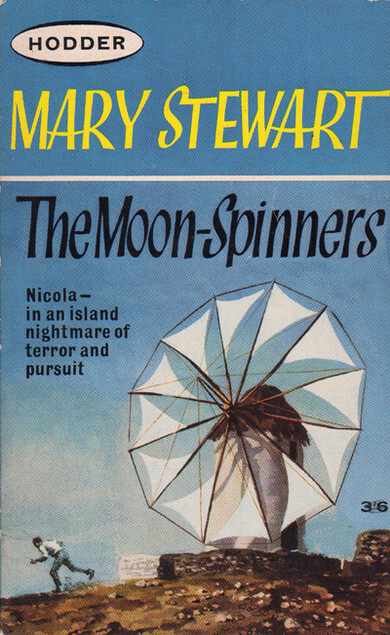 It certainly doesn’t hurt that The Moon-Spinners is quite beautifully written for its genre, in what I’ve come to realize is Mary Stewart’s trademark detailed travelogue style. It assumes a certain degree of intellectual and general knowledge among its readers, and refuses (for example) to reference in-text literary allusions, assuming our familiarity with them, something I always appreciate when done in an appropriate fashion, as a natural part of the narrator’s voice. The action scenes were relatively short, though no more believable than any of Stewart’s other escapades, and I found I managed to get through them with only a raised eyebrow, not an outright snort of indignation. Let’s see, now. The heroine is attacked once with a knife and once with a fish spear (the spear episode is while in the water, of course, with the heroine scantily attired in her underthings), and she is present while bullets fly about willy-nilly but ultimately harmlessly, and she manages to bring the chief villain to grief at the very end with a spur of the moment intervention. There are two successful murders (well, perhaps more of the lost-my-temper manslaughter-type murders versus deliberate planning) plus at least one attempted murder, all in just the first few days of what was supposed to be a restful botanizing vacation. Stewart gets the flowers right, and includes a clever Linnaean word-joke or two which I greatly appreciated, being of the horticultural persuasion myself. The whole novel is packed full of heart-racing action and instant romance, which keeps things clipping right along. 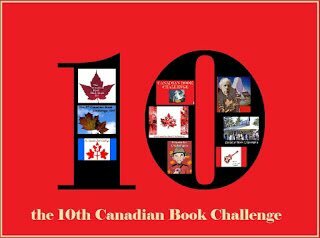 The side characters – the heroine’s older cousin, the hero’s local-boy sidekick and charming younger brother – are a fabulous addition to the story, and allow for an abundance of humorous repartee. Even the surviving villains are quite a lot of fun, if you’ll forgive my using “fun” in the same breath as “murderous villain”. One is prone to violent loss of temper, the other tiptoes around anything messy with faint disdain – “Well, I’d hate to have to kill you, but you leave me no choice. Oh, better yet, I’ll leave it up to my brutish sidekick here to deal with you. I just don’t want to know!” Together they make a diverting team, in every sense of the word. The murderees themselves are unlikable thug types, so we don’t shed too many tears at their demise. It was the egret, flying out of the lemon-grove, that started it. I won’t pretend I saw it straight away as the conventional herald of adventure, the white stag of the fairy-tale, which, bounding from the enchanted thicket, entices the prince away from his followers, and loses him in the forest where danger threatens with the dusk. But, when the big white bird flew suddenly up among the glossy leaves and the lemon-flowers, and wheeled into the mountain, I followed it. What else is there to do when such a thing happens on a brilliant April noonday at the foot of the White Mountains of Crete; when the road is hot and dusty, but the gorge is green, and full of the sound of water, and the white wings, flying ahead, flicker in and out of deep shadow, and the air is full of the scent of lemon-blossom? Lovely young Nicola comes on holiday to a remote village in Crete. Arriving a day early for a planned rendezvous with her cousin, she wanders into the hills and is assaulted by a knife-wielding Greek; he then takes her to a hut in which she finds a wounded Englishman, Mark. Much swearing to secrecy results; the hiding-out is because Mark’s fifteen-year-old brother has been kidnapped by a gang of thugs, one of whom shot Mark and left him for dead; Mark and Greek pal (Lambis) have realized that killer is now out searching for the not-quite-as-dead-as-thought Mark, to finish him off. A deadly game of cat-and-mouse keeps tension high as the various characters dash (or limp) from nook to cranny to shepherd’s bothy to niche-in-rock-cliff to ancient temple. After spending the night nursing Mark, Nicola reluctantly goes off down to the village, plays all innocent, and sleuths away like mad. The small hotel where she is booked to stay is run by an oddly assorted partnership. One is a local man, Stratos, returned from years away in England with a nest egg which he is investing in the hotel; the other is his English partner, Tony, a fabulous cook , darling – and also bar-man and waiter and general manager. Tony is much given to gushing extravagances of speech; his dialogue is well-peppered with italics. I wonder rather if Mary Stewart is trying to portray something more than personal eccentricity here; if this novel were a few decades older Tony would be the quintessential “catty gay guy” we see so frequently in contemporary chick lit. As it is there are one or two possibly double entendre references to Tony not being the heroine’s type, and her older cousin Frances, a sophisticated type herself, is quite catty in regards to Tony, calling him “Cedric” after the literary Little Lord Fauntleroy. Anyway, Nicola snoops about, discovers that all is not as it seems in this peaceful little village, identifies the villains, discovers the fate of the kidnapped boy, foils the nefarious plottings of the gang of villains, and finds true love. This takes several hundred pages, but they are filled with incident and description and clever conversation and in general are a pleasure to read. A good read indeed, completely effortless and a fabulous diversion from the onset of the Canadian winter. They’re naiads – water nymphs. Sometimes, when you’re deep in the countryside, you meet three girls, walking along the hill tracks in the dusk, spinning. They each have a spindle, and onto these they are spinning their wool, milk-white, like the moonlight. In fact, it is the moonlight, the moon itself, which is why they don’t carry a distaff. They’re not Fates, or anything terrible; they don’t affect the lives of men; all they have to do is to see that the world gets its hours of darkness, and they do this by spinning the moon down out of the sky. Night after night, you can see the moon getting less and less, the ball of light waning, while it grows on the spindles of the maidens. Then, at length, the moon is gone, and the world has darkness, and rest, and the creatures of the hillsides are safe from the hunter, and the tides are still . . .
Then, on the darkest night, the maidens take their spindles down to the sea, to wash their wool. And the wool slips from the spindles into the water, and unravels in long ripples of light from the shore to the horizon, and there is the moon again, rising above the sea, just a thin curved thread, re-appearing in the sky. Only when all the wool is washed, and wound again into a white ball in the sky, can the moon-spinners start their work once more, to make the night safe for hunted things . .
Worth reading the book, just for the bits like that. I’m liking Mary Stewart more and more! One more note. Disney made a 1964 movie based on this novel, starring Hayley Mills. It sounds like “loosely based” is more accurate; descriptions of the Disney production show that the plot diverges widely from Mary Stewart’s crisp thriller. Apparently no expense was spared in the making of the film, which was filmed on location in Crete, with Disney rebuilding a war-damaged village and engaging local people as background players. I’ve not seen it myself, and from the sounds of the plot changes, would not find the Disneyfied version of the story terribly appealing, but I would like to see the physical setting. Has anyone both read the book and seen the film? If so, would love to hear your thoughts! 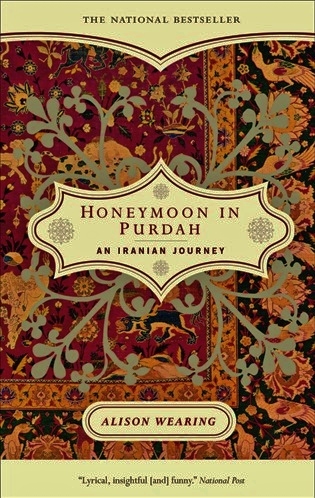 Honeymoon in Purdah: An Iranian Journey by Alison Wearing ~ 2000. 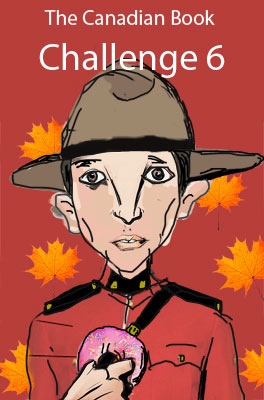 This edition: Vintage Canada, 2001. Softcover. ISBN: 0-676-97362-0. 319 pages. In 1995, a decade and a half after the revolution which resulted in the deposition of the Shah and the establishment of the Islamist fundamentalist government led by Ayatollah Khomeini, a young Canadian woman and her male partner entered Iran on tourist visas. Their official reason: a honeymoon journey. The not so official reason: for Alison Wearing, the chance to explore a country and culture vilified in the Western world as impossibly backwards and more than slightly dangerous for touristing. For her partner Ian, Iran is a second-choice destination. He really wanted to go to Bulgaria, but a fear of travelling alone and, one suspects, Alison’s more focussed drive and tenacious personality, have resulted in this joint trip. Before taking this trip together … we would spend hours poring over maps, planning long, arduous treks through desolate corners of the earth or road trips across continents. The only problem was my strong belief in travel as a solitary pursuit. And Ian’s fear of travelling alone… We settled on Iran because it was the only place I couldn’t imagine going on my own. And for a whole stack of other reasons that had nothing to do with our relationship. The year before we met, I had made my fifth trip to Yugoslavia. I went, in part, to visit friends trapped in the middle of war, but also because the media’s portrait of the place – full of barbarians and void of humanity – made the world seem unlivable. I refused to believe that such a place of unalloyed evil truly existed, that that was the end of the story. I went because I believed that there had to be more. And because I like to look for saints where there are said to be demons. Iran became our destination for the same reason. I have a confession to make. Ian isn’t my husband. We aren’t even lovers, just friends. We forged a marriage certificate just before leaving Montreal using photocopies of his brother and sister-in-laws document, and that is what we are using to get ourselves into hotels. Most proprietors don’t ask and of those that do, two have scrutinized the paper very seriously while holding it upside down, so we needn’t have worried so much about its appearance of authenticity. The thing we should have worried about, perhaps, is the effect that photocopying and whiting out of names on a marriage certificate might have had. By the time Ian and I had reached Iran, his brother’s marriage had collapsed. So that is the explanation of the double entendre title of this exceedingly revealing (yet not quite forthcoming) travel memoir. 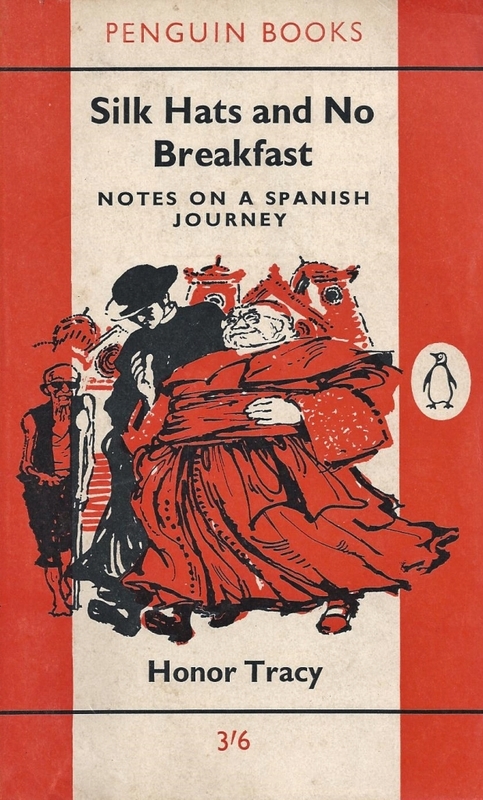 The author has been rattling around the world quite independently for some time already, a seasoned traveller indeed. But this trip called out for a partnership, because of the difficulties inherent in a woman attempting to move about unchaperoned by a male relative in a very strictly policed, Islamic fundamentalist country. It is doubtful that, alone, Alison would ever have been permitted to cross the border, with only “tourist” as her declared motivation. A honeymoon journey, while raising some eyebrows, is accepted as a valid excuse, especially when Alison, whenever necessary, willingly dons full traditional garb: manteau, headscarf, and all-enveloping chaador. First of all, there is no such thing as “wearing” a chaador. There is only “managing to keep one on.” And I don’t say this as a frustrated novice, but as an observer of scores of women who have been dressing with it most of their lives. The chaador is a living, wriggling entity, whose preferred habitat is the floor. Any woman trying to cover herself is not only fighting the true nature of the fabric, but also gravity, which has been in cahoots with the chaador since the beginning of time. The moment the chaador is on, wrapped in just the right way, covering all the right things, it begins its dogged descent, squirming along the sleek surface of the hair, hoping to make a clean leap to the neck, where it can secure a foothold for its plummet off the shoulders. An astonishing portion of the wearer’s energy and concentration goes into minimizing the creature’s progress, herding it back into position around her face, leashing it to her fingers and fists, or clamping its skin between her teeth. It doesn’t enjoy being corralled in this way. Thus the constant wrestling. The creature prefers damp, humid surroundings and feeds on sweat. The literal translation of chaador is “tent”, but from my own camping experience this seems a poor translation. The sack-shaped coat and scarf I have on right now are the tent. The chaador thrown overtop feels more like the fly. Alison Wearing fully embraces the experience of going – literally – undercover in Iran. Though she is deliciously sarcastic and witty throughout, she is also good-spirited and gracefully positive, describing her impressions on every aspect of her travels from the clothes to the food to the various characters she encounters to her long-suffering travelling companion Ian, whom, incidentally, we don’t really get to know, aside from a few brief vignettes here and there. It is rather as if Alison has chosen to shield Ian from examination, focussing instead on her own emotional and physical journey. It would be most interesting to read a parallel account of the Iranian episode from Ian’s point of view; one suspects his inner voice would consist predominantly of one long, high-pitched scream, triggered by Alison’s continuous flittings off and nonchalant eventual returns: Ian seems to (understandably) spend much of his Iranian time in a state of high anxiety. Alison must have been an utterly exhausting partner for their five months “honeymoon” in Iran. All criticism aside of the self-indulgence of relatively well-heeled Western travellers sightseeing in troubled Eastern countries – and Alison addresses this dichotomy in her narrative numerous times – this book is an excellent example of a modern travel memoir. It opens a window into a very different culture, and it educates and informs as much as it amuses. And it is very amusing. And poignant, and heart-rending, and – this goes without saying – thought provoking. Well done, Alison Wearing. Many years have passed since Alison took her Iranian journey and wrote about it so wonderfully well. In the meantime she has married, had a son, and pursued numerous other interests, including the successful production and performance of a one-person stage show based on her childhood, adolescence and young womanhood, much of it centered around the situation of her father’s “coming out” as a gay man – albeit one with a wife and three children – in the 1970s, in conservative Peterborough, Ontario. Confessions of a Fairy’s Daughter is Alison’s second memoir, published just this year, some thirteen years after her first book. I am looking forward to reading it with anticipation; I had thought to add it to my Christmas wish list, but I suspect I will acquire it long before then.